This recipe is for everyday chefs at home. But if you happen to be in the vicinity of a barbecue, the chops are even better when grilled over charcoal. Simply coat the meat with a thin layer of olive oil along with the rosemary and garlic, and light the fire. Peel the garlic clove, cut in half lengthwise and slice into slivers. Scatter the slivers over the lamp chops. Cut the rosemary into 1-inch (2 cm) segments and place on top of the chops. Allow the chops to sit at room temperature for about 15 minutes to allow the flavors to infuse. Heat the olive oil to sizzling in a frying pan. Add the chops, leaving the garlic and rosemary on top. They will cook when you flip the meat. Reduce the heat to medium high. Cooking time will vary according to the thickness of the chops. 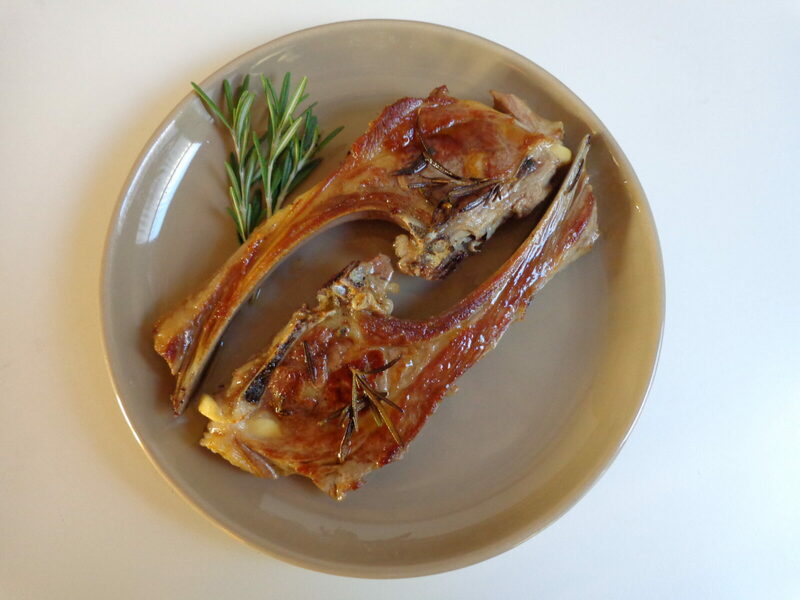 If you like your lamb medium-rare, I would suggest 3 minutes per side unless the chops are quite thin. For very rare, make it 2 minutes a side, and for medium to well, 4 minutes a side. To check for doneness, insert a fork into a thick part of the chop. If the juices run red it is rare, if pink it is medium rare, and if clear the chop is well done. If you would like to make a wine sauce, remove the chops to a plate, add the wine to the pan and stir with a wooden spatula to mix the wine with the lamb drippings. When the sauce is bubbling, return the lamb to the pan briefly to heat through. Remove the chops to a serving platter, drizzle with the pan sauces and season with salt and pepper. Serve with vegetables or potatoes alongside, accompanied by a sturdy red wine. Serves 2. Excellent recipe! I do one very similar – I add a touch of lemon zest. It adds a touch of lightness to it.